When loose bodies have formed in an elbow joint, they have usually formed because of some other problem in the elbow joint, with osteoarthritis being the most common cause. 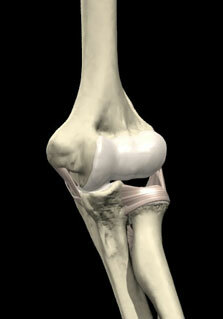 People can often live with loose bodies in their elbow and not have any problems. When they do start to cause the problems listed above, the problem can be solved by removing the loose bodies from the elbow joint. This can be done via minimally invasive techniques, using elbow arthroscopy. Using these techniques causes less surgical trauma to the muscles and allows an earlier rehabilitation and recovery. It is important to remember that simply removing the loose bodies will not “cure” the primary problem- namely the osteoarthritis which may be a cause for mild ongoing pain. Different operations are available to treat elbow osteoarthritis however most patients are able to tolerate the mild pain quite well.